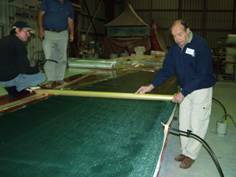 KSS is the method of custom boat building which is applied to all Kelsall and non-Kelsall designs. KSS is the only build method to have ever been subject to regular development and is more efficient than any alternative. Custom Boat Building does not need to be labour intensive. KSS gets rid of the onerous tasks in handling sticky, smelly resin and abrading in order to achieve smooth surfaces. KSS changes the whole atmosphere of the boat building shop. The process improves the work of the boat builder on the shop floor and attracts a different type of boat builder. The enthusiasm of the men and women doing the job is visibly improved, with benefit to the whole project. The use of full size panels ensures fair lines for all parts of the structure. The feature, of being able to apply the foam to one of the sandwich skins, bend to shape and then set by adding the second skin, is essential to KSS. The typical panel is produced by first applying the Gel coat to the table and allowing it to cure. The foam core and glass for both skins, is laid out on the table dry. The resin infusion is set up and infusion itself takes an hour for the largest panels. The vacuum pressure does the work, while the builder monitors the resin flow. One person can produce the largest panels with complete confidence. Resin Infusion is reliable and ensures a neat, clean job that is the best quality. Markings are set out on the mould table before laminating and are transferred to the finished panels. These include the stations and outlines of the various parts of the panel that are needed for the shaping process. The deck edge moulding has become an important part of KSS. This feature enables us to apply a deck edge radius to the hull panel while it is still on the table. The deck edge radius batten enables the builder to apply a deck edge radius to the hull panel while it is still on the table. The batten is made using a length of suitable plastic pipe and a steel angle. Set on the table along the sheer line, a beautiful rounded sheer line is guaranteed after hull shaping.